Same things happened the last 10/15 times thus far. Most times the rain splits and Yea is dry in the middle, I witnessed this band shown above, normally it would be impossible not to have 10-20mm but it was literally like watching someone trying to paint over silicone. For anyone who hasn’t brushed paint over silicone…silicone rejects paint. These are major anomalies without a logical answer! I request yea.com.au contacts the B.O.M to ascertain the cause and please post their reply. 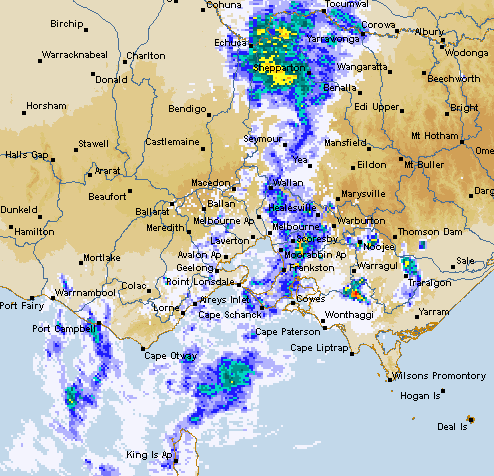 Hi Phil, sent off a request to BOM re: the splitting of the rain band a few weeks ago. Said I should receive a reply in about 5 days, but no joy after all this time. Hi Phil, I have been watching the weather for some 12 years in Yea and I totally agree with your observations. I’m guessing it may be something to do with the beginning of the Great Divide but I will make further enquiries.